Japanese island Nishinoshima has grown to 11 times its original size due to the volcanic eruption started in 2013. A recent observation has shown that the volcano goes on erupting ever since and a new increase of the island’s area is expected. The actual size of the island is 1.95 km from east to west and 1.8 km from north to south, its area is 2.46 square kilometers, but the scientists say there is still plenty of magma to erupt. "There have not been any significant changes at the volcanic vent of the pyroclastic cone, where eruptions of lava are seen several times a minute," Kenji Nogami of the Tokyo Institute of Technology said, the Daily Mail reported. "Magma has risen to shallow areas of the vent, and lava flows to the east have continued to stretch out. Therefore, I conclude a stable supply of magma is continuing." The authorities recommend vessels to navigate in 6 km distance from the island as the volcano can spit steam, ash and rocks. The smoke billows up to an altitude of 1,200 meters. Japanese Coast Guard observes the island from the air using various modern technologies. The island is located 1,000 km south of Tokyo in the Ogawasara islands chain, also known as the Bonin Islands. 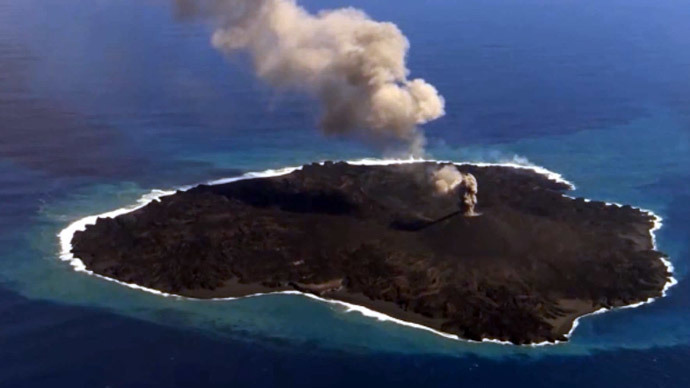 The volcanic explosion that happened on November 20, 2013, formed a new piece of land to the southeast of Nishinoshima, made of cooling magma. The eruption continued unabated and increased the size of the island, with scientists predicting it would link up to the Nishinoshima island. On December 26, 2013, the Japanese Coast Guard confirmed that the two islands had in fact joined up. The authorities said they would not give the combined island a name until it became stable.